Hawk-Eye Detective cameras were introduced in 1888 by the Boston Camera Company of Boston, Massachusetts USA. 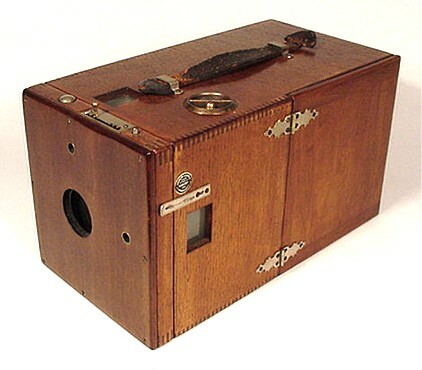 Although this camera was named the Hawk-Eye Detective, it is also known as the Hawkeye Detective camera. The dash is often dropped in popular usage. 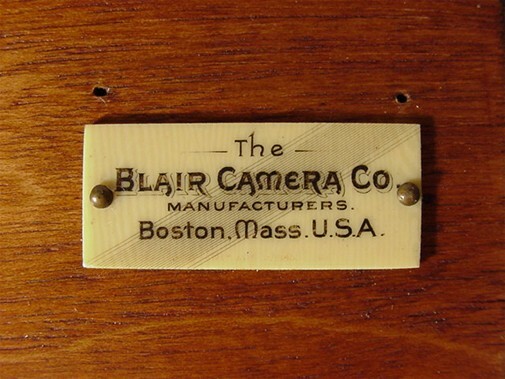 The Blair Camera Company, also of Boston, purchased the Boston Camera Company in 1890 and continued manufacturing this camera until 1898. 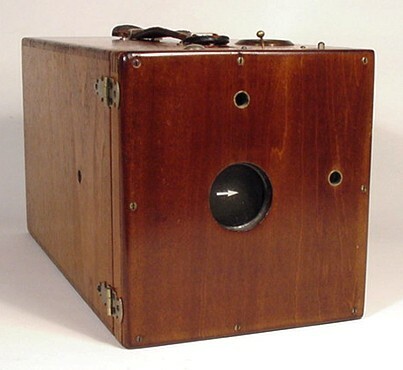 It is believed that the Boston Camera Company did not manufacture its own products and that the Blair Camera Company manufactured the Hawk-Eye for Boston Camera Company. Blair made various improvements to this camera over time. This example is known as an Improved model. 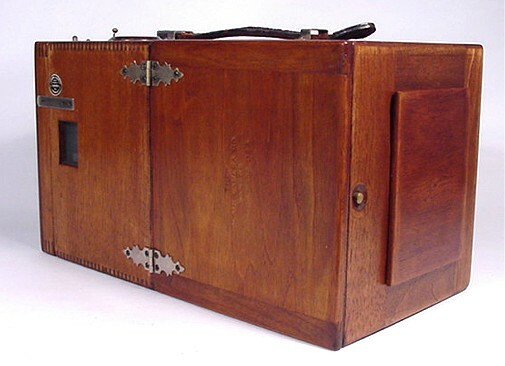 The Hawk-Eye Detective is a wood-bodied box camera that made exposures on 4 x 5 inch glass plates. Plates were loaded into wooden holders. There is room inside the back of the camera to store a few extra plate holders. This camera was also capable of shooting roll film via an accessory roll holder. The white arrow seen above is painted on the shutter blade. To arm the shutter, a wire spring protruding from the top of the camera is latched to one side or the other. This tensions the shutter. After the shutter is released, one of two white arrows will appear, facing left or right. If the arrow points right, then the wire will need to be latched on the right side for the next exposure. If it points left, then the wire needs to be latched on the left. This photograph shows the Hawk-Eye from the back, and laying on its side. The hinged side door is opened fully, revealing the ground glass focusing screen. I have removed the back panel. It was previously covering the rectangular hole in the back of the box. The panel needed to be removed in order to view and focus the scene on the ground glass. 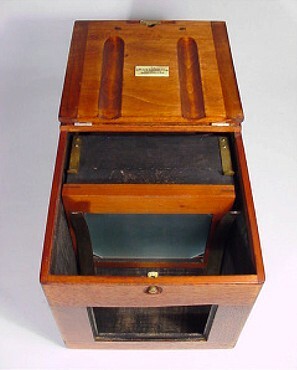 Once the scene was composed, the ground glass, which is mounted in a wood frame would be slid out of the box and a plate holder would take its place, ready for exposure. This is a view from the back of the camera. The hinged side door is now closed and the back cover panel is back in place. 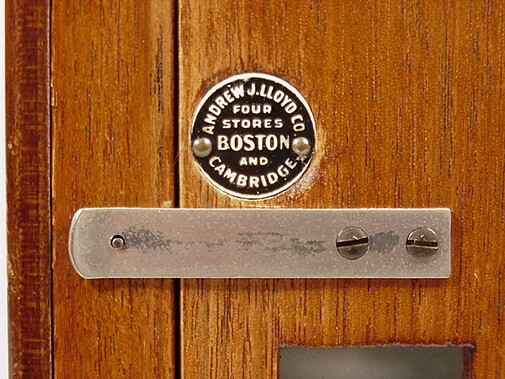 The round brass button on the back of the box is the door latch release. The shutter is built into the hinged front door. You can see the tensioning wire protruding from the top of the shutter. The wire can be moved to one of three positions. This allows three levels of tension, and three different shutter speeds. I guess you can call these speeds slow, medium and fast. There are two chrome buttons; one on each side of the tensioning wire. These are the shutter release buttons. One button is for time, the other is for instantaneous exposure. The brass-bound lens has a wheel-stop diaphragm, adjustable from f16 to f512. I have not run across very many lenses that stop down as far as f512. The lens is marked: Albert Sellner, Quincy NY, Unique Wide Angle 6 1/2 x 8 1/2. In this photograph, two viewfinders are visible. Two viewfinders allow both horizontal and vertical compositions. The viewfinders can be used instead of the ground glass for composition. 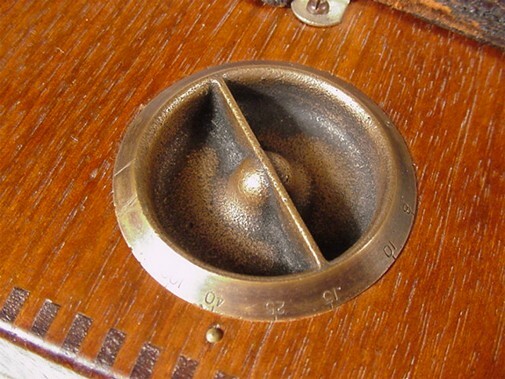 The focusing knob is engraved in feet. The closest focusing distance is 6 feet. Follow this link to view a patent for the Hawk-Eye Detective camera. 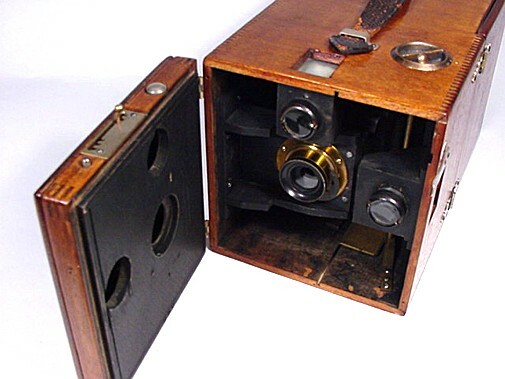 A fascinating, unusual and uncommon camera, the American Camera Manufacturing Company No. 7 Buckeye is featured on this site. American Camera Manufacturing Company was another of Thomas H. Blair's business ventures.